Ced’R-Vue siding delivers all the weather ability and performance of natural cedar without the inconvenience of continual maintenance. With its deeply textured wood-grain appearance, Ced’R-Vue siding is always a favorite among new homeowners. 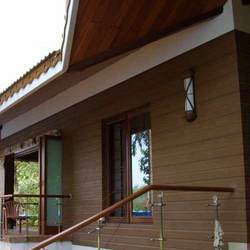 As an eminent enterprise, we are are engaged in offering the best quality Vinyl Wall Siding. Saint Gobain Brings to india, "Viyl Sidings" the most preferred External wall. Functionally, vinyl siding material protects your home’s structure from the elements, mainly rain and wind driven moisture. We offer a wide selection of exterior cladding products. - Automatic sliding sensor doors.